ont> Methuen and Co : London, 1898 Book. Very Good. Hardcover. A smartly bound collection of Rudyard Kipling's popular poems, all about the British Army. 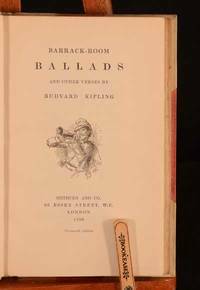 'Barrack-Room Ballads' is a collection of poetry dealing with the late-Victorian British army. The poems were originally published in 'Scots Observer', before being collected into this anthology. The work contains some of Rudyard Kipling's best known works, including 'Danny Deever', 'Gunga Din', 'Solider, Soldier', 'The Widow at Windsor', 'The Young British Solider', 'Gentlemen-Rankers', 'The ballad of East and West', 'The Sacrifice of Er-Heb', and more. Kipling is best known for his novel 'The Jungle Book', however he was a prolific writer of poems, novels, and short stories. Being born in India inspired much of his work, and he went on to become one of the most popular writers of his time. Condition: In the original half vellum binding with cloth to the boards. Externally, smart. Some discolouration to the spine and to the extremities, which is to be expected with this type of binding. Minor marking to the boards. Internally, firmly bound. Pages are bright and clean. Overall Condition: Near Fine.